In April 2004, the Daily Wildcat newsroom was named in memory of the late Sherman R. Miller 3rd, a much-admired and respected adviser to the Wildcat in the 1960s and head of the UA journalism department. Inducted in November 2003 to the Wildcat Alumni Hall of Fame, Miller is remembered by scores of alumni as a dedicated men­tor who set high standards of professionalism both in class and at the Wildcat. The Sherman R. Miller 3rd Newsroom is the result of a generous $25,000 gift from his family as part of our Building for the Future Campaign. At the time Miller was Wildcat adviser, the paper was part of the journalism depart­ment. Miller turned the paper into a daily in 1964 before the Wildcat split from the de­partment in 1966. 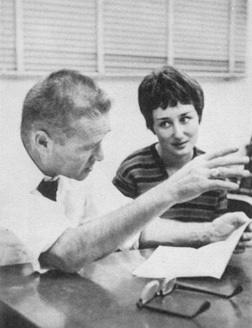 Miller died unexpectedly while teaching on a Fulbright abroad in 1968. View Life and Times with Sherm Miller, a book of memories by his former students. As a older student in 1964 at the UA I had the privilege of being a student of Sherman Miller. He was a great leader of the journalism dept..I learned much from a great pro.